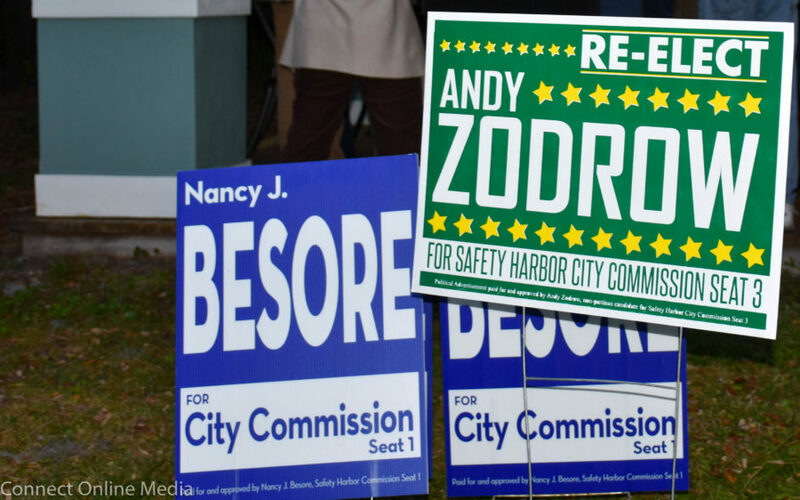 Incumbents Andy Zodrow and Cliff Merz and former commissioner Nancy Besore claimed the three open City Commission seats in Safety Harbor’s 2018 municipal election held on Tuesday, Mar. 13. 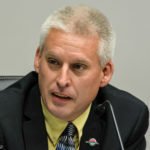 The results were revealed shortly after the polls closed at 7:00 p.m., with Besore and Zodrow winning Seats 1 and 3, respectively, and Merz handily earning his third straight term on Seat 2. A look at the 2018 Safety Harbor municipal election results as reported on the Pinellas County Supervisor of Elections website. 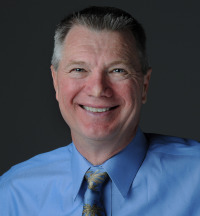 The results were surprising to some considering Besore narrowly failed in her attempt to reenter local government last year following her “retirement” from public office after losing a mayoral race in 2014, and Zodrow had been embroiled in a heated and often contentious campaign battle centered on downtown development against opponent Damon Lister. 2018 Safety Harbor municipal election winners Andy Zodrow and Nancy Besore were all smiles at their post-election party at the Safety Harbor Museum and Cultural Center on Tuesday, Mar. 13. 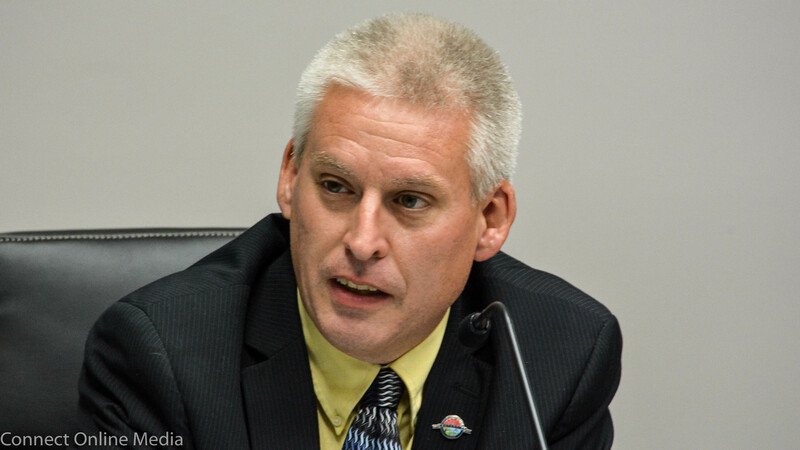 But after being reelected to a second full term, Zodrow said the results spoke volumes about the direction residents want the city to go in. “I think it’s a referendum on how people are reviewing development in the city, that they’re concerned that there’s too much going on too fast,” the environmental attorney said from his post-election party at the Safety Harbor Museum and Cultural Center. Besore, a retired schoolteacher, spent six years on the commission before losing a three-way mayoral race in 2014. At the time she said she was done with public office. Yet she returned to run for Seat 1 last year, and after losing to Scott Long by fewer than 50 votes in 2017, Besore turned around and defeated the popular incumbent by 74 votes on Tuesday, and she said the win was especially gratifying. “It just feels very hopeful. I feel very hopeful,” she said, also from the museum. 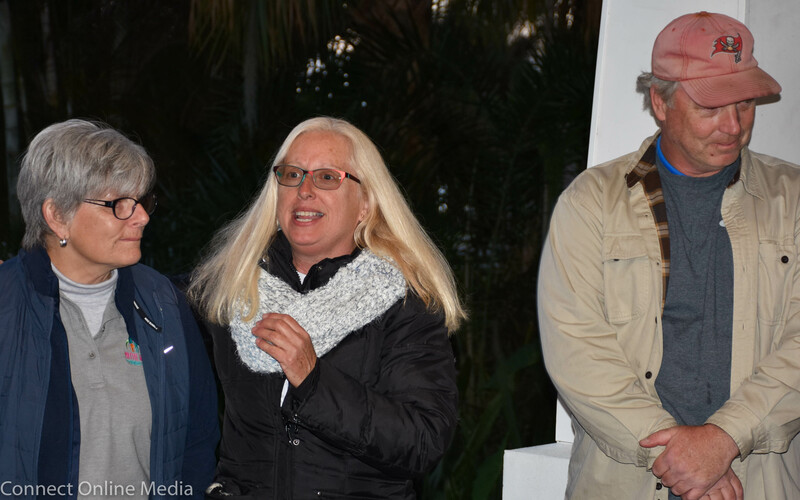 Nancy Besore (c) celebrates her 2018 municipal election victory with former Safety Harbor City Commissioner Janet Hooper and fellow 2018 winner Andy Zodrow at the Safety Harbor Museum on Tuesday, Mar. 13. A few blocks away from the joyous victors’ celebration, Long and Lister tried to remain positive despite the devastating results. 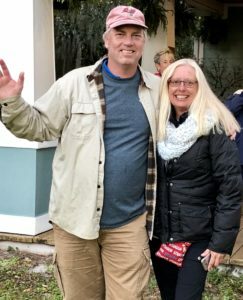 The former newspaper journalist and cofounder of an online poker magazine became well-known in the community over the last 12-plus months for taking a strong stance on several key issues as well as his penchant for dressing in colorful costumes and keeping the residents informed about everything happening in the city via social media. 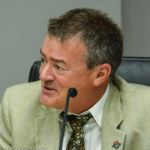 Long said despite losing the election, he would remain involved in local organizations and activities, including his upcoming planned attempt to break a Guinness World Record for watermelon eating this summer. 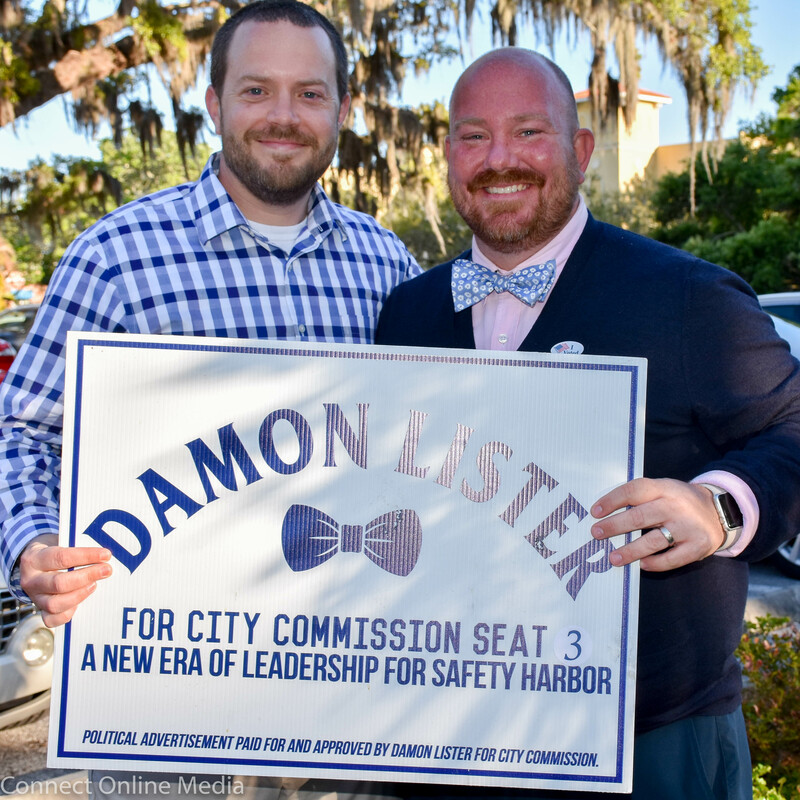 Damon Lister (r) campaigning outside the Safety Harbor Library on Tuesday, Mar. 13, 2018. Over at the Barfly Saltwater Grill, an emotional Lister was still attempting to process the loss. “I appreciate all the volunteers and people who put a bunch of effort into this,” the former economic development liaison said as his supporters consoled him. Perhaps the least surprising result of the night was Merz’s decisive win over Spencer Bell. While Merz has served on the commission for the past six years and ran unopposed during his last campaign in 2015, Bell was a relative unknown locally despite his extensive political experience at the state level. Afterwards, Merz expressed his thoughts on his latest victory. “It’s been a great honor and pleasure to serve as City Commissioner the last six years, and I’m thankful and humble to continue for another term,” he said by phone on Wednesday. The three winners will be sworn into office during the next City Commission meeting on Monday, Mar. 19. 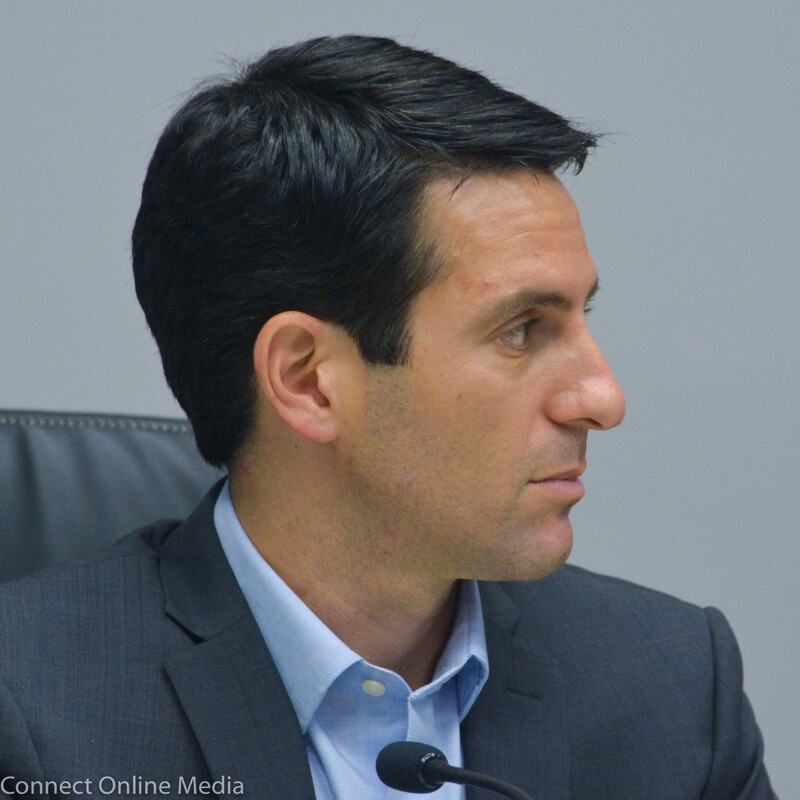 On Tuesday night, Mayor Joe Ayoub spoke about the conclusion of another campaign season. 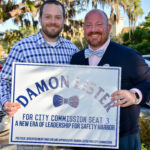 “I want to congratulate all the candidates who threw their hat in the ring for their courage to go through a rigorous campaign and their desire to make Safety Harbor an even better city,” he told Safety Harbor Connect. Noticing a lack of comments, I’m wondering if it is too much to hope for, that the trolls are staying away. Perhaps the lion has been temporarily fed, and is snoozing….. I am remaining positive as ever. We have a new building going up on Main & 2nd and new residents moving into our charming city. You can’t stop progress especially when so many want to live and enjoy our beautiful city. The train has left the station and we can only move forward, not backward. So enjoy, go out and celebrate Safety Harbor. Every day is a blessing. I moved to Safety Harbor 32 years ago; the small-town quaintness, and all the beautiful oak trees, were the primary draws for me. Sadly, in recent years I’ve witnessed City officials sell out to builders/developers. Obviously all that “progress” cannot be undone. But hopefully, with more conscientious leadership, what’s left of our little town’s charm might be maintained. I second your additude Brenda Hupp. So glad Safety Harbor residents are waking up! I find the other “you cant stop us” additude is naive. Congrats Andy and Nancy!! #MakingSafetyHarborGreatAgain!! #DraintheSwamp! Lisa, I like your hash tags. No one can stop progress but you can be smart and work with it. 30, 20, even 10 years ago were probably all great but we can’t live in the past. If you do then you are cheating yourself of today and tomorrow. Outside of the one incident relatively early on, I thought this one of the most positive and least contentious elections in recent memory. I commend all the candidates and their supporters for that. Andy said, “it’s a referendum on how people are reviewing development in the city, that they’re concerned that there’s too much going on too fast.” I’m not sure I’d call it a referendum, after all, he had just 55% of the vote and and Nancy had just 51%, but I think its an indication that Safety Harbor residents continue to work towards finding the right balance between growth and preservation. A couple of elections ago we elected a commission that leaned heavily towards preservation, 2 years ago we elected a commission that leaned more towards development, now we have a commission that seems somewhere between those two. Thank you, Paul. Your thoughts are intelligent and factual. It’s what we in Safety Harbor need for the future. One building has been built in like the last 10 years. What are you talking about? I don’t think you’ve been paying attention. There are scores of new huge 2 story houses, sometimes multiples on a small lot where one used to be. 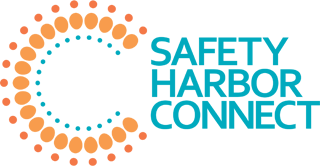 This combined with the zero setbacks that have been approved are changing the feeling and charm of our town. This has a possibility of destroying what is so appealing in Safety Harbor. Those of us who love the small town feel are concerned. So what did Zodrow and Hooper do? They took a downtown fight and went and increased setbacks in the northern part of town for no reason. No one was asking to add an extra five feet of unbuildabke space for homeowners in R2. I know it’s just terrible to see the new two story’s whose owners take care of their house and keep their front yards nice. I hope when the run down properties sell they only accept exactly what they paid for their property, surely they won’t use comps in the area to make some money on their investment. Better not use any of the insane taxes new properties pay for bettering Sh either. That would be just aweful. Make sure you don’t walk into the new retail and use their services, that would be so hypocritical. I laugh when I sit in barfly or Starbucks and hear people talk about the bay to bay project being too tall while they enjoy services while sitting in a three story building. Small Town Fan – Density is Downtown Living in 2018. This is a movement bigger than SH. It is National. The burbs are passé for the Millennials and now the Baby Boomers. Homeowners still want nice homes, great neighborhoods & schools but with a walkable community. Location, Location, Location. And Safety Harbor has it all plus more.